Hello Beauties...How are you all. I am super excited and actually refreshed after my recent fun trip. This was the reason why there was a delay in reviews, well but now I am all here to share a very interesting, unique brand with you and its amazing products. The brand is Allin Exporters which is mainly famous for its essential oils but also deals in floral oils, food oils, wild crafted essential oils, Indian attars, fragrance, diffusers, massage spa oils, aromatherapy oils etc, you can check the Allin Exporters Website for complete details of the products. Why Shop with Allin Exporters as per the brand? • Shipping by only reliable shipping agency. I personally heard about this brand long before and also read some of its rave reviews, after which I literally wanted to try it but somehow the products were not accessible to me and sometimes not in stock, may be due to huge demand or something else. 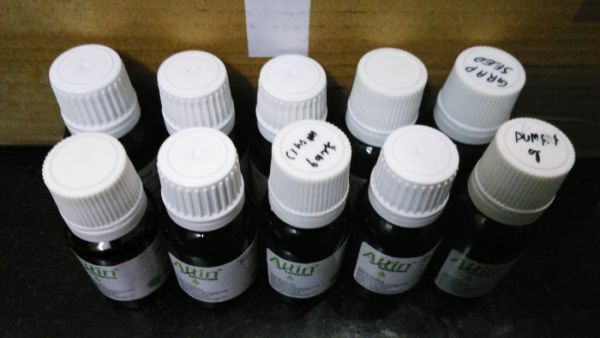 But finally I have my hands on some very useful beneficial essential oils from Allin Exporters. There are like infinite number of oils available on their site, you think, name and you have it. Like I got to know about some very unique oils on their site which I didn’t find in any other brand and some very popular like Rosemary, Neem, Lemon, Sandalwood etc, so it was very tough for me to decide which all to order since it was very difficult to stick to few after viewing their amazing collection of essential oils which were all organic and pure. After lot of struggle, I finally ordered 10 oils and here is the list of these. These essential oils are great in themselves with multiple uses and I would just brief you about some of the main uses of these, why I ordered and what is my experience with these oils. I haven’t used all these oils so would be sharing mostly about those I have used and experienced. These oils can be used for multiple purposes from skincare, hair care, health care to home care including homemade home fragrances. 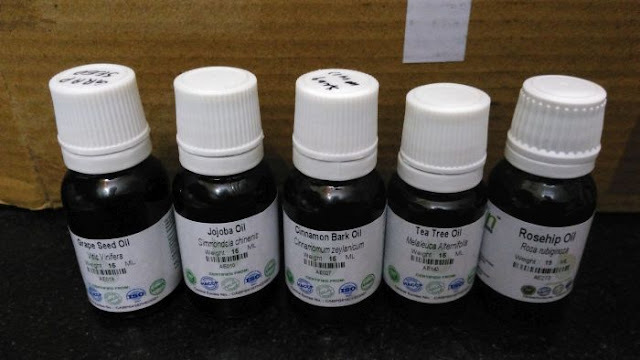 I would not go in detail about different uses of this essential oil but list out the main basic like Tea Tree Oil is used normally to treat acne pimples and comes as a savior for acne prone skin on overnight basis. Then Grape Seed oil, Carrot Seed, Pomegranate oil are helpful in getting rid of pigmentation, scars and actually revitalizes skin if used properly. Grapefruit is specially famous for its sensuous aroma and thus makes it special place as a common ingredient in fragrances, then Rosehip oil is great for treating dry skin because of its amazing feature of boosting collagen production thus treating those fine lines, wrinkles on regular usage and lastly this Ylang Ylang oil is normally good for massage since it has a very relaxing effect on body and kind of helpful in soothing your entire body stress and fatigue. 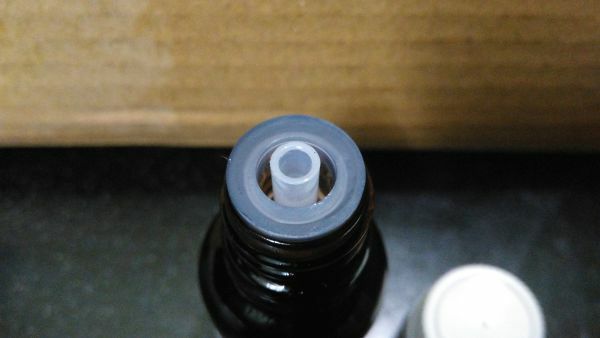 I actually wanted to make some of my own skincare, haircare diy's, for these winter months and thought these Allin Exporters Essential Oils would be a great option to use. My skin is actually behaving differently since few months, like its more prone to acne now. I had quite acne prone skin in my teenage, which somehow got better on its own when I was in my twenties but for some reason I am again getting breakouts, may be because I am enjoying different foods, cuisines, spices these days and also trying different products for PR and my sensitive skin actually becomes sensitive on using too many products. Moreover, I have been little dull in my skincare routine since few months, not specific like before because of so many other things in my life. So I was waiting to make my own customized homemade diy skincare products to have my skin like before and finally because of these Allin Exporters Essential Oils and few other base oils and products, I was able to make my own homemade diy toner for acne prone skin. I have been a fan of tea tree oil and its products, because it always suits my sensitive acne prone skin. I have been a frequent user of Modicare Tea Tree Oil since it normally works on my pimples quite nicely that too in a very short period but I feel the quality is not the same now or may be it doesn't suit my skin like it use to before. It does dry my acne to quite an extent but it takes days even on using it directly on my pimples and leaving overnight. 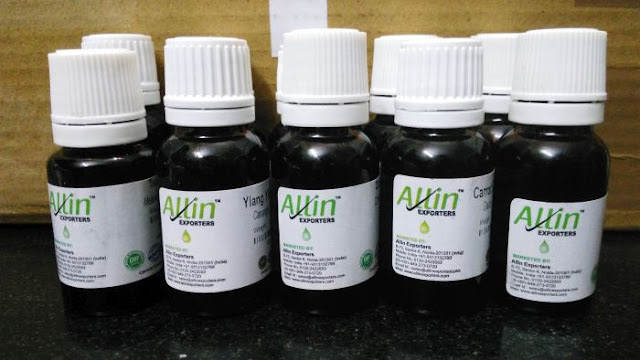 These Allin Essential Oils come in regular dark colored glass bottles like other oils with orifice reducers for easy release of oils drop by drop so that there is no spillage and wastage. 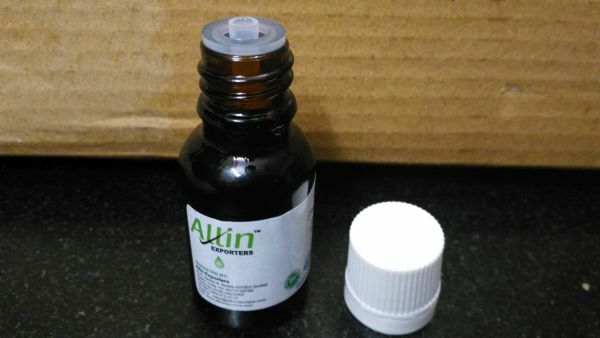 For a change I tried this Allin Exporters Tea Tree Essential Oil on my acne and to my surprise, it actually worked quite nicely and dried my popped pimples to almost flat in about 2-3 days. I was little skeptical about it, because of which I wanted to try it direct on its own before making a diy tea tree oil toner but since it worked so nicely I made my own diy tea tree oil toner for acne and pimples since its more convenient to use along with being gentle on my sensitive skin and I am very happy with the results after using it for 10 days. I would share the recipe with you guys very soon which actually involves very few ingredients, main being Allin Exporters Tea Tree Essential Oil. I would also like to add here that along with tea tree oil, I also added Allin Jojoba Oil, which is good for both pimples and dry skin and since my skin is also prone to dryness in winters, I thought adding Jojoba oil would be a great option for that moisturizing effect. Other than this I have used their Carrot Seed oil, Pomegranate Oil, Grape Seed oil to make my own homemade diy face serum for pigmented skin. I wanted to add lemon oil as well but I didn’t add have of Allin, so used of Aroma. I made this face serum for my mom and its been almost a week she is using the serum and quite satisfied with the results as of now. I would share the recipe of this as well very soon. Lastly I used this Grapefruit oil to make my own home mist which is organic, skin friendly and also smells so good. I have been quite enjoying, actually loving most of the Allin Exporters Essential Oil. They are of high quality, pure and quite useful in making diys. I have been enjoying its benefits and keep trying different recipees and diys since you have the power to add what you want as per your skin type. I have also used their essential oils in aromatherapy as well as the ultrasonic diffuser. Their quality as well as the prices as far more better than other overhyped brands available in the market.